The 25-year old Russian-trained Ukrainian pianist Anna Tcybuleva has won the 18th Leeds International Piano Competition, taking away a gold medal, a £20,000 cash prize and the promise of a debut recital CD recorded at the music room, Champs Hill. This was the last competition at which founder Dame Fanny Waterman chaired the jury. The next competition is in 2018. 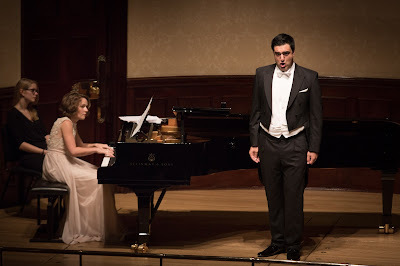 Whilst over at the Wigmore Hall, the 28-year old Swiss baritone Milan Siljanov has taken the top prize in the 2015 Wigmore Hall/Kohn Foundation International Song Competition., receiving a £10,000 cash prize and his accompanist, Nino Chokhonelidze took the £5,000 Pianist's Prize. Anna Tcybuleva is Ukrainian and studied first with her mother, then at the Shostakovich Music School in Volgodonsk (Russia), Moscow Central Music School and at the Moscow State Conservatory and she is now at the Basel Music Academy. Her CV includes an impressive number of awards in international piano competitions. Milan Siljanov was the First Prize and Audience Prize winner of the Lied-Duo competition at the 50th International Vocal Competition in ‘s-Hertogernbosch, the Netherlands. He is currently studying at the Guildhall School of Music and Drama. He appeared in the schools recent double bill of Malcolm Arnold and Donizetti operas (see my review) and was a finalist in this year’s Gold Medal competition. He will give his debut at Tonhalle Zurich, Switzerland, this year.